A farmer and sons walk in the face of a dust storm in Cimarron County, Oklahoma, in April 1936. (CNN) - The northeastern U.S. continues to deal with the destructive aftermath of Hurricane Sandy, a storm some say was goosed by man-made effects on the environment. Decades ago, there was another event that prompted similar questions. The Dust Bowl of the 1930s was one of the worst man-made ecological disasters in U.S. history. Its combination of drought, wind and ill-advised farming practices set the table to create vicious dust storms over nearly a decade's time. The fiercest occurred over a region that included the Oklahoma panhandle and four other surrounding states. Homesteaders who lived through the storms called them "black blizzards," or "tornadoes on their sides." [2:23] "Looking back on it, I think it carried with it a feeling of being unreal but almost being...evil." The dust storms rolled over open land killing people and livestock. Sand dunes buried farm equipment and derailed trains. And the storms gutted the financial futures of families. 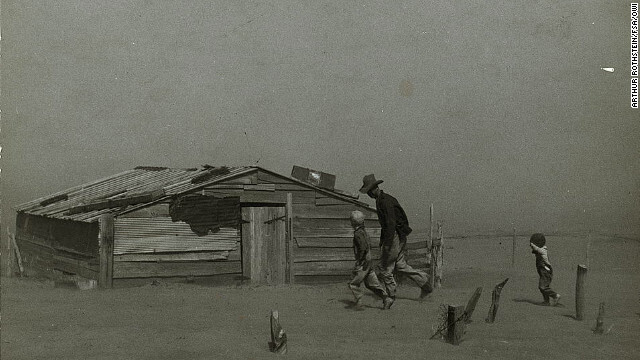 A new Ken Burns film airing on PBS explores the Dust Bowl – the factors that created it, and lessons that can be learned from the event. The film's writer and producer, Dayton Duncan, says it's a story not only about Mother Nature, but about human nature. A great boom in wheat prices and land prices fueled a desire to get rich without regard to future consequences. [3:43] "Once we start feeling that way, whether it's about real estate prices or Mother Nature, we're setting ourselves up for a crisis." Duncan says it's a lesson to take from history for our current times: we cannot conform nature to fit our desires. "some say" was "goosed" by man-made effects on the envionment. You mean 97% of climate scientists and all of the other independent scientists with findings consistent with ...GLOBAL WARMING. It's ok, you can say it out loud. Only those that haven't even read a wikipedia article on it will look at you strange. Go ahead you guy, type it into google and check the news feed. Take a glance at allllllll those crazy hoaxers pushing that political/scientific agenda for more money. Is it really so hard to believe that pumping large quantities of a heat-trapping gas into the atmosphere for almost a century would change the composition of the atmosphere and have negative consequences for us uber-special, "ineffectual" humans? Its the cycle of life, the cosmological movements of the heavens and the fact you're just a bug in the headlights of reality. ~ me. we're human – so quite understably we won't have learned a single thing from past events. To think that farming, especially on an agri-industrial scale, has no effect on the land, is ludicrous at best. If we strip the countryside of vegetation and pave the cities with black asphalt, clear-cut our rain forests and drown the seas with plastic trash, we shall reap what we sow. By failing to head the lessions of history man may repeate the Dust Bowl disaster once again. An article in the Washington Post today does a very thorough job of describing how Brazil has just surpassed the United States in soybean production. They are agressively overworking their prairie lands to become the World's bread basket. I suggest that the government of Brazil make the Ken Burns Dust Bowl Series a must watch for all of its prairie farmers. Nowhere in the article they say that Brazil is aggressively overworking their prairie lands to become the World's bread basket, quite the opposite. The article says Brazil successfully converted once considered unproductive scrubland in very productive land. Ken Burns always does a great job on what ever topic he is presentiing. A grest book to read on the the Dust Bowl/Storms is " The Worst Hard Times" by Timothy Egan. Get used to it, the current farming practices of the 20s and 30s are being relived in the US today. With out of control land prices fueled by government subsidized commodities the toll on the US farm land is enormous. Uncontrolled pattern tiling is preventing absorbtion of any water to replenish the ground water, windbreaks are being torn down to get that one more acre to plant. If it doesn't stop, camels will be a normal animal in the US farmbelt. Actually, it was PRIVATE companies and corporations involved in land speculation that urged Americans to move to the prairies in the teens and early 1920s. This grasslands ecosystem had seen a few years of unusually abundant rainfall and the venture capitalists swooped in to make a killing. Some of these capitalists involved in the land speculation deals of the prairies were actually indicted, convicted and served time in federal prisons. Sound a bit like the vultures of Wall Street and big Banks of the 2008 economic meltdown? Only difference, none of them went to prison for their crimes against the citizens of the United States. The US Homesteading Act was decades before the Dust Bowl. Learn some history, knowledge is a good thing. The disaster level was man made not the weather. Thanks to the dust bowl the Soil Conservations Service was created to help educate farmers and ranchers on how to prevent this from happening again. Windbreaks, prevention of water and soil erosion among other things were implemented to help conserve our natural resources. Government opened up the land for farming and screwed things up then take tries to take credit for fixing the mess that it created. Government opened up the land for farming..and tried to give farmers land to farm and grow crops...what were they thinking? The "weather" is much more suseptible to manmade affects than most people have a clue. 1950's cloud-seeding in the Korean War, dust-bowl -evapotranspiration cycle disuption in the 1930's and most recent, hurricane seeding efforts in the Atlantic basin just over the lat 10 years – which leave residual heat to eventual fuel NorEasters. Insuance companies and Oil Companies are funding this so-called research of engineered weather. The 'dust-bowl', and ergo, subsequent storms and disasters related to this, ARE made-made. The land should NEVER have been made-available to farming. The Gov't, in all their wisdom and short-sghtedness, started all-that. Period. I AM an environmentalist. If the land is left to grassland, as its' evolution deigned-it to-be, no 'dust-bowl' occurs. The drought was a natural cycle of that region. This cycle was documented (for its' time), and well-known to locals, who, of-course, the gov't did not listen-to. The 10-12 years that rainfall occured was the anomaly, not the drought. Whaddabout that little Haarp Military Installation in Alaska???? in Russia??? in Europe??? in Northern Africa???? The primary cause of the dust storm (drought) was NOT man made. I consider myself an environmentalist... and when I continue to see absurd claims of 'man made weather' I can only sigh, as it takes away from the credibility of the environmental movement. Wasn't it Man, who stripped that area of all its natural vegetation, and thus set into motion, the dynamics that lead to this? Wait – wasn't the dust bowl and dust storms the result of farmers having removed all the native prairie grasses to plant wheat. Those grasses had deep root structures that held the soil in place, even during drought conditions. Once the drought started, the ground dried up and was no longer covered by vegetation, so that the wind simply lifted the soil into huge dust storms. That's my understanding from everything I've read. My parents lived in the extreme southwest corner of Kansas through the entire period of the dust bowl. My brother died of "dust pneumonia" in 1935 in Hugoton, KS. Even though I was born after the dust bowl, it was a frequent topic of conversation when I was young. It was definitely a MAN-MADE disaster due to over-farming. Too much acreage was plowed under for wheat. Droughts were a regular occurrance, but seem to have been forgotton or ignored. One change in farming in the last 75 years is the increased use of irrigation. Now the water table is dropping significantly. It cannot drop forever. I am not an expert in agriculture or the use of natural resources, but it seems to me that we may be generating another scenario (lack of water for irrigation) that could result in another crisis. Russ, its nice to see a comment from someone that lived it. For better or worse, now we use no till farming. I HATE the idea of using chemicals (Round UP from the evil empire of Monsanto) instead of tilling up the land. I have seen many a windy day that 15 years ago would have produced dust storms, but now don't. I think we are between a rock and hard place. No till saves the soil, uses less diesel, and appears to maintain or improve productivity. On the other side of the coin, covering the land with these chemicals can't be a good thing. A decade ago we ruined our water supplies with nitrates from too much fertilizers. Now that problem is being addressed but a new one is taking its place. Check back in 5 years to see if we can drink the water then. Right now we can't. Please do a little research into the history of this disaster, before so quickly going into denial about why it happened. lol, you consider yourself an environmentalist that doesn't believe in man-made weather? Well, you would be right not to make the direct connection between climate change and weather, but not so right to conclude that we couldn't have an effect on our environment which would in-turn have an effect on the weather. It's called climate change.